Cotton + Steel mini made for the Cotton + Steel Mini Quilt Swap using Fat Quarter Shop’s “Snapshots” sew along Sewing Machine Block. Here it is! I used the Fat Quarter Shop‘s Snapshots Quilt Along Block 2 Sewing Machine Block for my mini quilt. I used the matches fabric because I thought it looked like lights on a screen of a modern computerized sewing machine. I stitched in a little needle with black thread and wrote “I just want to sew all day long” in thread as well. All fabrics are Cotton + Steel including the backing. I didn’t take a shot of the back but it’s the mint with metallic gold dots. It was Melody Miller’s border print from the first group of lines they released. 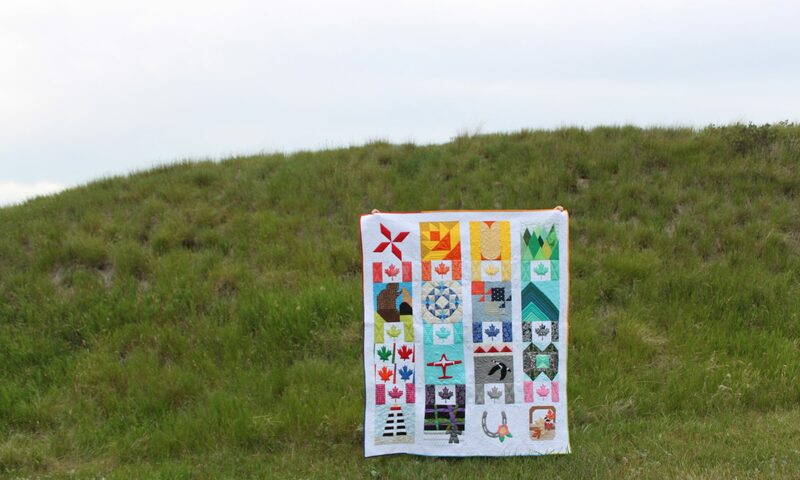 If you haven’t heard of Fat Quarter Shop’s Snapshots Quilt Along it’s a fun quilt along they are hosting that benefits St. Jude’s Children’s Hospital in the USA. For each block pattern you download (there are 12, one for each month) they are asking for a $5.00 (minimum) donation to St. Jude’s. I donate $10 every two months. I think some people have also donated $60.00 at the start and then they are set. Of course, if you are able to donate more you certainly can. St. Jude’s sends tax receipts out in the mail for the donations. I bet your partner was thrilled with this mini! What a perfect mini!! Why the heck did I not join this swap??!!! Wahhhhh!! Next PostNext One Lovely Blog Award!